Would You Like to Succeed by Becoming a Great Blogger? I believe blogging is one of the best avenues to achieve success. Whether your dream is to lead a great church, build a great company, bring lots of people to faith in Christ, fight an injustice, or anything else, blogging can help you accomplish that. In fact, you’re probably already reading the blog of someone you admire because they’re successful at something similar to your dream. I want to become a better blogger, and I want to help you become a better blogger, whether you’ve got years of experience or are just thinking about starting your first blog. Let me explain how we can do this together. Darren Rowse is one of the most successful bloggers on the planet. He authors the ProBlogger blog which boasts 136,000 RSS subscribers and has helped thousands of people earn a living blogging. 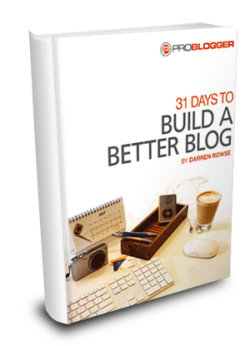 Several years ago Darren did a 31 Days to Building a Better Blog project. Thousands of bloggers participated as each day for 31 days Darren posted a blogging lesson & gave a homework assignment. I bought a copy of 31DBBB for $20. I skimmed it, and it’s fantastic. I could go through it and do it on my own, but what would be the fun in that? I want to do 31DBBB with a group of people who are as passionate about blogging and self-improvement as I am. Experience is irrelevant. I hope the group includes some people who have been blogging for years as well as some who are just starting their first blog. Far more important that experience is passion and a willingness to commit to about an hour a day, every day, for 31 days. Yes, that’s a big commitment. But I wouldn’t make that commitment myself if I didn’t believe it was worth it. How do we make this exciting? Becoming a better blogger is its own reward, but because this project requires a big commitment, I want to add some incentives and some excitement so that we’ll look forward to all 31 days. This is where I need your help. What would help make this exciting for you? What if there were prizes for things like the blog that sees the biggest increase in traffic over the 31 days? Or the biggest jump in RSS subscribers? What if OCC offered free hosting for a year to any blogger who made it all 31 days? What if we found some WordPress theme developers who would offer big discounts or free themes to participants? What if we created some sort of forum so that participants could get honest feedback on their blog’s design, topics, writing style, etc from other participants? What if we could get a famous, celebrity blogger to participate? I want to finalize the details this week so they can be announced on Monday and we can start the 31 days to a better blog on Saturday May 1. So, before you click away could you real quick answer these questions for me in a comment? How interested are you in doing the 31 Days to Building a Better Blog? Which of the ideas mentioned would you like to see as a part of this project? What other prizes, incentives, or other ideas do you have that would get you excited about the project? Bring it on! I've been trying to take blogging more seriously as one of many means of helping to build up the church (exactly the point of my most recent post on Prayer Experiment), and I'd love for it to reach a wider audience, because I believe that more people praying more often is a great thing. What do you think the commitment would look like? Thanks Chris. My guess is that on average it will take about an hour a day to read that day's lesson, and do the "homework." Sometimes the homework is writing a blog post, other times it's some kind of interaction or planning. I imagine it could take more time to post questions to a forum or give feedback to other blogger. One good thing is that when you buy the 31 Days to Building a Better Blog, it's one big PDF, so it's possible to work ahead if you know you'll be busy on a particular day. w00t!! I def want in on this one, it sounds awesome! For myself I'm pretty new to blogging so I'd love to get in, if only for the sake of practice. 3) they all sound great but the forum sounds best. 4) I'd like to meet some other serious bloggers in person. Just sit down over lunch or something and pick their brains. A bloggers meetup would be cool. I particpated in one at the Catalyst conference in Atlanta last fall and it was a lot of fun. It won't be possible to get everyone who does the 31DBBB project together, but maybe a few here and there would find themselves close enough to meet up. Where are you located? I'm in the DC area: live on the Maryland side but spend most of my time in the City. Ah, I lived in Columbia, MD for several years before moving back to Florida (Tampa area). When I create the sign-up form for this project I'll include a box for location & "interested in meeting face-to-face with other bloggers"
I would love to participate, I've been scratching my head trying to figure out how to become a better blogger. 4) any helpful tech toy or free coffee would be great, lol. 4)like the free hosting for a year, Chris's mention of an iPad is pretty cool! I'd saddle up and give it a go. 1. Technically yes, but I also get bucked off a lot. 2. I'd rather snap my fingers and make it better, but since that's not an option–SURE! 3. Honest feedback is cool, but could there be a dishonest feedback where everyone said my blog was cool even if it wasn't? 4. The greatest prize of all is just sharin' Jesus Christ. Chocolate milk is second. >>Honest feedback is cool, but could there be a dishonest feedback where everyone said my blog was cool even if it wasn't? Great point. That could be one of the challenges. We would really have to stress that people must be willing and able to both give and receive criticism to participate. You have my word that i will speak the truth in love and will do everything I can to create an atmosphere where that is what happens. Being a Pastor, rancher, and Dad makes me pretty thick skinned, but I trust ya on the speakin' in love and truth. Maybe you could talk to a WordPress guru and make the prize a USB plug in for my head so I can download everything I need to learn. I have learned this though: RSS doesn't stand for Really Stinkin' Simple. Not sure I'll be able to manage the USB plug, but having a wordpress guru available for questions would be a great idea. What sort of problems are you having with RSS? No problems with RSS. It's just that in the Cowboy Church ministry, some of the folks we're tryin' to reach barely know how to turn their computer on, Try explainin' RSS to a cowboy that asks, "What does right click mean?" Ah, I understand. Have you ever tried showing folks the What is RSS video that's on this page? I'm down! Been trying to get more intentional about blogging for my business and for my personal blog. I like the link building idea. I'll talk about that with the OCC staff. Well now I'm a little sorry I suggested that! I didn't really think it would be a possibility, because they ain't cheap, so feel free to smack me. Free iPad or not, I'd still love to do this, and the best reward will be greater impact. LOL! I doubt OCC would spring for an iPad, but I'm leaving open the possibility that maybe there's an organization that might want to partner/sponsor this project and maybe they would. I would totally do it and been looking for something like this for a while. I think the motivational ideas are great, also. 3. All of them. I specially like the one about a famous blogger. Hi Andres, I think everyone would like more visitors and more comments on their blog. Any ideas as to how we could help make that happen? I have a brand new website that will soon have free dowloadable bible studies. I want to attract seekers and new believers to the site. I have written two blog entries in two weeks – 31 days sounds like a big committment but I would like to give it a try. 2. Big commitment – but I'm in. 3. Feedback forum would be great, so would WordPress theme development. 4. Free SEO for a year. This sounds like an excellent opportunity as we have started a new congregation in St. Cloud, Florida and I'm already writing on a daily basis. 3. As the pastor of a new church, with limited resources, the full year of hosting would be great. 4. To be able to reach out to the community online with the Good News and frank discussion on what we can do to help make our churches and our country better. 4. I'd simply be happy to learn "better blogging" techniques. 3. Tech toys always top my list (after world peace of course). 4. To help grow my ministry. I've had 31 Days for several months and have wanted to do it with a group. So I'm willing to give it a go. But, I'm moving across the country in the middle of the 31 days. I'll try my best to keep up. I know I will learn something from the experience. 2. Been waiting for something likes this. 3. I definitely like the forum idea. 4. Maybe a side group for those of us who might not make the 31 Days, but are trying to push forward. Susan, would be great to have you as a part of this project. >>Maybe a side group for those of us who might not make the 31 Days, but are trying to push forward. Seriously, though, this brings up an important issue I've been thinking about. I know there are a lot of people who would like to improve their blogging but are unwilling or unable to commit to 31 straight days. On the one hand, something is better than nothing. On the other hand, if we say it's ok to miss days, then when things come up or we get tired or whatever it makes it easier to skip. I think it's also important to consider this issue from the perspective that this is a team project. Everyone wants to learn about blogging and get feedback on their blog from others, but this will only work if we're all also willing to share what we know and give feedback to others. When people are hit-or-miss or selective about their participation, they tend to show up when they have questions and want feedback and then don't show up to answer others questions and give feedback. I would love to participate, to be able to spread the Word and also to spread the information about my business. 1. I have two blogs at present one on WordPress and one on MerchantCircle. 2. I would be willing to commit. 3. I like the free hosting, WordPress Themes, and the honest feedback and blog suggestions. 4. I diffinately like the postrank idea or even software that allows you to create offline then post when you go online via Word (all versions). 1. Yes, but I feel I'm getting no where! 2. Absolutely rabid! Been wanting this. 3. Feedback and shared journey sound great, but the others could be interesting. 4. Learning, connecting, and getting the Word out are the best rewards I can think of. I have tried to blog and have several entries… but no one ever reads them. Or at least they never leave comments, so I don't know if they read them. I really wonder if I have written a lot of stuff that no one has ever read. But I would like to use it as a tool to bring more interest to my web site. Right now, things are so tight, that I don't think I even have the 20 bucks to do this… but it does sound interesting and intriguing. I'm interested. My blog is mostly family stuff. We are home team missionaries with a mission organization and I have three young children. I like to vary my topics from serious to light-hearted. I'd love to improve! 2. Interested. I think the daily commitment would be tough, but I might be able to do it. 4. Prizes are nice. Blog design is always a bonus and an area I could use help. 1. Not currently, but have not learned how to get started. 3. Community feedback and the chance to learn. 4. The I-pad is not a bad idea, or a net book pc would be ok.
3. i really like most ideas…esp the postrank, free hosting, help with wordpress themes…. 4 prizes are fun, gaining knowledge more important…esp blog design help. Lois, I never post on the weekends here on Christian Web Trends or on my personal blog, so 31 straight days would be be a big commitment and require some sacrifices for me as well. 4. Internet ads (google, facebook) would be great prize and incentive. 2. Very interested. However, I will be traveling without easy access to the Internet for a few days in May. very interested, what and where is the sign up? Or what information you need to enroll. Hi Pete, there's no sign-up yet. This post is just to gauge interest and get ideas from those who will participate as to what we can do to make this the best possible project. I want to do another post today summarizing some new ideas & asking for feedback on a few questions. Then I'll do a post Monday or Tuesday with all the details finalized and sign-up instructions. 2. On a scale of 1 to 10, make it 8.7? 3. A. Prizes? If something is really worth doing, why do you have to bribe us with prizes? Are we in nursery school? B. I have my hosting setup. D. This is worth doing! E. Celebrities? Please, are we in high school? 4. If the project is worth doing, you don't need to bribe me. I doubt even the best bloggers have many people hanging on their every word. In my opinion the key is whether you blog for selfish reasons or blog to help your readers in some way. If a person blogs to help others, or inspire people towards a cause, or provide insight into a particular field or interest that doesn't sound like "unadulterated self-intoxication" to me. >>Prizes? If something is really worth doing, why do you have to bribe us with prizes? Are we in nursery school? I like you're attitude! If some sort of prizes are awarded, I certainly hope people don't participate purely for the prizes. It's just intended to add a little fun. But ultimately, I hope people participate because they really want to become a better blogger, and because they really wan to help other bloggers. I want to better my bloggin for two reasons: to share my faith and to supplement my husbands income…. so..
1. Do you blog? Yes, on a friend's site, etc. 2. How interested are you in doing the 31 Days to Building a Better Blog? I am interested very much so. 3. Which of the ideas mentioned would you like to see as a part of this project? I would love to participate in this project to win the years free hosting for my church's website. 4. What other prizes, incentives, or other ideas do you have that would get you excited about the project? Maybe free blogging lessons, free web domains, etc. Good idea Paul, count me in. 3. I like them all you know, is that being greedy? 4. The tuition is enough incentive Paul. I don't think I need much more than encouragement and knowledge that someone is reading it. 1. I don't blog, but I want to learn. It would help to do it together. 3. I like the opportunity to get feedback from other bloggers, especially high profile bloggers. 4. Competition is a great incentive. So is the opportunity to help people. Hey everyone, thanks for all the responses. I’m excited that so many people are interested participating in this opportunity to become better bloggers. I am going to do an official announcement tomorrow, but before I do that, I thought I’d post my latest thinking here and give you all one more opportunity to provide feedback before the details are finalized. •Do it only on weekdays – A lot of people expressed interest but said they might not be able to do it 31 straight days. Personally, I don’t blog on the weekends because of family, church, and a desire to rest. I know I will enjoy this a lot more if I’m not killing myself to do this & I hope you will too, even though it means we won’t finish until June 14. This also gives you a chance to catch up on the weekends if you miss a day or 2 during the week. •Guest posting – There is going to be a post on Christian Web Trends for each of the 31 days. I’m going to invite participants to guest post. Guest posts will include a short bio plus a link to the bloggers blog, so it’s another way to help build your reader base. •Comments/Links – As an incentive for participants to comment & to post to their own blog, participants will be invited to include at the bottom of their comments a link to the post they posted to their blog that day. If a person hasn’t posted a new blog post that day, no link. •Forums – In addition to discussing the topic/lesson of the day, participants will be able to ask & discuss other blogging related questions in OurChurch.Com’s forums. •Reviews/Feedback – Everyone seems to want to have other participants review & give feedback on their blog. My concern is that if we have 50 participants, we’ll get 50 posts to the forums on the first day asking everyone to check out their blog & give feedback, and then everyone will be disappointed at the lack of feedback. So, here’s how I’m thinking we will do it. Starting Day 11, I will pick one blog each day for everyone to review & provide feedback on that day. I will start with the blog of the person who is most active commenting on the blog posts, responding to questions in the forums, and go from there, so the more you contribute to the project the more likely you are to receive the benefit of a review from the other participants. •Rewards – Of course the biggest reward from this project is that you’ll become a better blogger, which will help you achieve your goals. But in addition to that, OurChurch.Com is going to give away from free hosting and search engine marketing services to participants. I'll announce the specifics tomorrow. Sorry, no iPods, iPads, or trips to Hawaii. I dig. I'm (truthfully) relieved about the plan to focus on weekdays. The only thing I felt reservations about was the possibility that I'd be doing this on weekends as well. This is a great idea, even without the iPad 😉 Thank you! Sounds good. Just let us know what we are supposed to do. I'm ok with 7 days per week seeing as in reality you can write ahead and schedule the blog to post on Sats and Suns.. I am totally on-board, Paul. I'd love to do the 31 days, in particular because I want the accountability. I look forward to the announcement. 1. Do you blog? Yes. 2. How interested are you in doing the 31 Days to Building a Better Blog? VERY interested. 3. Which of the ideas mentioned would you like to see as a part of this project? You have a lot of great ideas. I'd be excited about any of them you chose to incorporate as part of the project! 4. What other prizes, incentives, or other ideas do you have that would get you excited about the project? It sounds good to me as is. I'm pretty new to blogging regularly and am excited about all of it at this point! OK peeps, the official announcement is up. Very exciting! I've had a blog "Inspirational Christian Stories, Poems, Gifts" since 2006. I get about 1,000 hits per month but few comments and followers. I would love to be a much bigger hit. I want to inspire people with my true stories and original poems. I want visitors to submit their inspirational stories and poems. I also promote the gifts I sell on my "Inspirational Gift Gallery" web site. I would also like to find a way to promote another Christian business I recently joined up with without it being repetitious posting. I would love to participate in the 31 Days to Building a Better Blog! I think prizes for things like the blog that sees the biggest increase in traffic over the 31 days and the biggest jump in RSS subscribers would make it a lot of fun. It sounds like a challenge to me and I love a new challenge! I think a forum is an awesome idea! Who couldn't use feedback from a variety of different people as inspiration to improve their blog’s design, topics, writing style, etc? Yes, for over a year now and I am averaging about 1800 views per month praise God but I want to reach more to help people find Christ and encouage them as they serve God. 4. Which of the ideas mentioned would you like to see as a part of this project? Any are fine but I would do it for free. 5. What other prizes, incentives, or other ideas do you have that would get you excited about the project? Cannot think of any. 3. Which of the ideas mentioned would you like to see as a part of this project? Any is fine, but I don't need a prize. I love to blog and want to be a better one because anything worth doing for the Lord God is worth doing well. 4. What other prizes, incentives, or other ideas do you have that would get you excited about the project? No further ideas because I feel none should be needed. Tom, we made the official announcement, including instructions on how to sign up. Sorry I missed that, I have signed up now. Thanks. Yes, I would love to do it, but I am still trying to figure out how to move it on my homepage and archive past blogs. I will take any help in making it better. – click your cursor (mouse) in the editor at the spot where you want the blog to appear. – Click in the "Insert Module" option just above the editor, and select "blog"
Past blog posts are automatically archived.